We’ve reached the midseason finale of Arrow. Where does the time go? 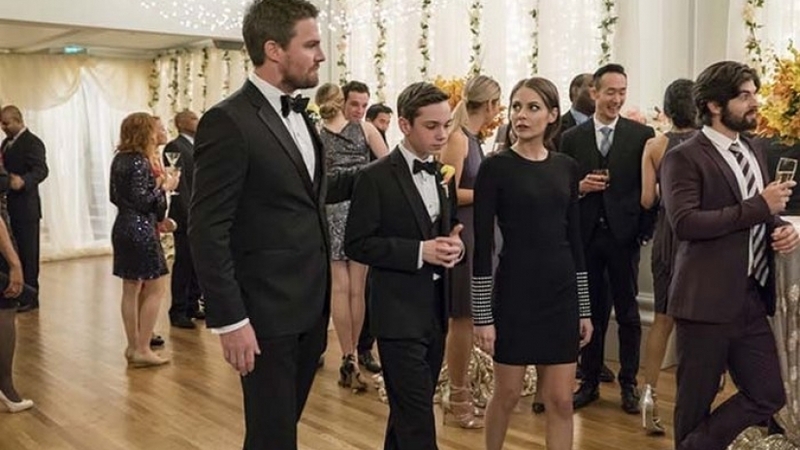 As sad as I am to see the show leave us for the next five or six weeks, I’m thrilled to get to watch what heads off this episode: Oliver and Felicity’s wedding reception. Because of course, Donna Smoak would not let this wedding go uncelebrated. And because this show loves its main couple and the fans. Don’t even tell me I’m wrong about that. 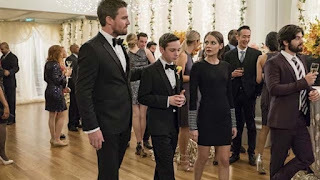 The episode kicks off with the grand reception and boy... is it ever grand, right down to the couple on top of the tiered wedding cake that look exactly like Oliver and Felicity. Oliver is happy to have Thea out of her coma and in attendance but he’s also a bit nervous because Felicity isn’t there yet. It’s kind of adorable how nervous he is. Thea points out that the two are already married, so there’s really nothing to stress out about. And that’s when Felicity arrives, on the arms of her proud parents. And to categorize Oliver’s expression as “awestruck” seems like an understatement. I’ve never had anyone look at me that way before... and I’ve been married nearly twenty years. These two actors certainly know how to sell the chemistry, I’ll give them that. Plus, Arrow pulls out all the stops, having Felicity enter in slow motion, and to beautiful music. After Donna gives the couple a bit of a hard time for eloping and not having a proper Jewish wedding, Oliver steals his wife away and they share a sweet kiss. The reception is perfect. There is cake cutting (and feeding), bouquet tossing (Curtis catches it, narrowly beating out Donna), and a first dance (featuring Etta James’ “At Last” which is so on point I could weep). We even get a cute scene with Oliver and Felicity talking to the Hoffmans (their old neighbors from Ivy Town), and get to see Curtis flub his speech and Rene smoothly take over. As if that wasn’t enough, we even get a bit of awkwardness between Noah, Donna, and Quentin, when the latter cuts in on the former dancing together. Sadly, then the plot of the episode interrupts and we must get on with the rest of the episode. Oliver is upset. And rightly so, but he wears his betrayal like a cloak for almost the entire rest of the episode. Someone he has trusted — that he has brought into his life and welcomed even at his wedding reception — has sold him out. And not a minor thing either; he could be locked up for life, away from his wife and son. As a man who finally has gotten his hands on everything he’s ever wanted, the threat of having it torn away is a bitter pill to swallow. He’s immediately suspicious of all the newbies and Felicity offers to track them because... well, that’s what we do on Team Arrow. We all have trackers installed, apparently. I mean, it’s super handy when one of them is kidnapped I guess? The team learns that Dinah is meeting with Vigilante. And Vigilante knows who Green Arrow really is. I’m a bit unclear on whether or not he knew before Dinah said Oliver’s name, but the fact is that Oliver is concerned Vigilante would rat him out to the FBI. So Dinah is promptly shunned and she takes it about as well as you’d expect. Team Arrow has been her family and life since they found her, and now to find that there’s no foundation of trust there? It stings more than a little. The rest of the team is upset to learn that Oliver and company have been tracking them and it leads to a lot of bickering. Amidst that bickering, Rene drops a bomb: He is the one who talked to Watson and has agree to testify against Oliver. Rene explains that the FBI agent used his daughter against him. She knew he was Wild Dog and could make it so he’d never see his daughter again if he failed to cooperate. Rene did what any father would do, which Oliver recognizes later (thankfully so, since that’s essentially what he did when he left the team to spend time with William). But before Oliver finds understanding, he feels the betrayal and he tells Rene to leave. Curtis and Dinah aren’t too happy though. Things go from dicey to worse when Black Siren, acting under Cayden James’ orders yet again, abducts Quentin and knocks out Thea. Cayden is holding Quentin hostage in return for some device that is being held at ARGUS. The device is apparently something that will help Cayden build this super bomb he’s been threatening to use for a while now. He wants the team to break into ARGUS, steal the device, and trade it to him for Lance. If they don’t cooperate, Lance is dead. It’s kind of a no-brainer and Oliver brings Rene back because he knows they need the whole team on deck for this. They get into ARGUS, take the device, and arrange for the trade. Simple, right? Except Cayden realizes pretty much right off the bat that they’ve sabotaged the device and he can’t use it any longer. The deal is off. Curtis and Rene disobey orders from Oliver to go hunt down Lance, which ends up being a good thing, but Oliver doesn’t see it that way after the fact. Black Siren lets Lance go, so he’s fine, but Oliver is feeling very upset that the team didn’t follow the chain of command. Rene is out because Oliver doesn’t believe in giving a third warning, prompting Dinah to bow out as well. She goes right to Vigilante, telling him she needs someone who will stick by her and that may just be him. Curtis also leaves, claiming he feels disrespected. It leaves the Original Team Arrow, alone in the bunker. Which is a bit eerie but also not the worst thing that’s ever happened. Of course, we have to end with something juicy and that is the reveal that Cayden is not just working with Black Siren, but with Anatoly, Vigilante, and Ricardo Diaz as well. It’s a whole flock of villains, waiting to rain down badness on Oliver and Star(ling) City. And that’s all we have until the middle of January. I choose to believe that Oliver and Felicity jetted off to Aruba after this to spend a long, sun-soaked honeymoon together while Thea and Raisa kept William company at home. So what did you think about Arrow’s midseason finale? Was it great or did you think it was lackluster? And how many times have you re-watched those reception scenes? Sound off below!